Food Haven czyli Przystanek Jedzenie: "Chestnuts roasting on an open fire..."
The first time I've tried chestnuts was in Paris and actually (I know it's sacrilegious) I didn't think much of them. In one of the beautiful jardins I helped myself to a crepe with a chestnut filling. I was rather unimpressed, the chestnut filling felt too sweet and bland. 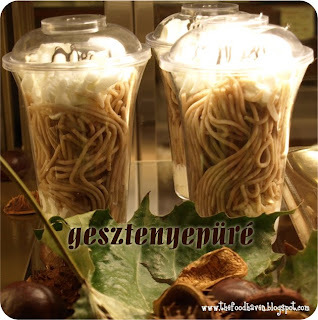 The second time I've tried chestnuts was in Budapest in the magical Nandori Cukraszda (patisserie) - my choice was Hungarian specialty gesztenyepüré - chestnut puree looking like spaghetti served with whipped cream... and I fell in love with them. 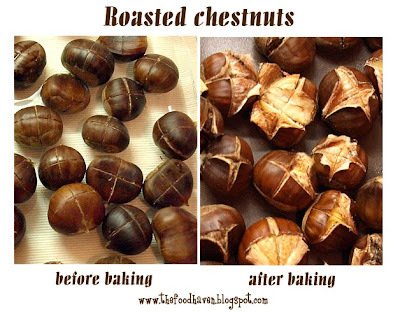 The smell of the roasted chestnuts evokes the Christmas atmosphere right in the middle of November. 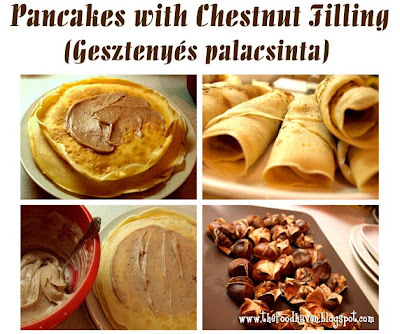 I love them simply warm, roasted/ baked in the oven or as a filling for pancakes (Hungarian chestnut pancakes - gesztenyés palacsinta). A tip on buying fresh chestnuts: choose the ones with dark and shiny skin. They should feel firm and hard - it's beacause they have a high water content. If they're soft, off-colour, dry - they'll be probably rotten inside so avoid them. Mix in a bowl 2 eggs, 2 spoons of vegetable oil, 1 glass (250ml) of milk and pinch of salt together. Still mixing add a glass of all-purpose flour and around half a glass of water to achieve the right consistency. Warm up the teflon frying pan with just a teaspoon of vegetable oil, then lower the heat to 4-5 (maximum on my cooker is 6) and fry the pancakes. There's no need to add any more oil for frying. Take 25 dkg (250g) of chestnut puree* & mix with a handheld mixer. 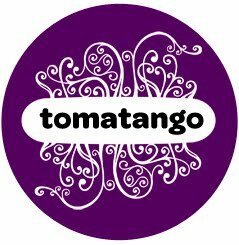 Mix in 7 tablespoons of plum mousse** (or some other jam, the more liquid and sour the better), 50g of finely ground sugar, 1 package of vanilla sugar with real vanilla, 1 tablespoon (15ml) of lemon juice, add 50g of soft, but not yet liquid butter and 4 tablespoons of milk. Spread the chestnut filling on a pancake then roll it. You can warm it up a bit on a frying pan or in the oven/microwave if it cooled down, if not, just serve with a bit of icing sugar or some plum mousse. *In Hungary you have a plenty of choice of ready ones. They're sold frozen, so before using them for pancakes you need to leave them for a night to defrost. You can also try out using crème de marron - chestnut puree with vanilla, sold in jars. For sure you'll find it in a good foodstore. **my mum's specialty - recipe coming soon together with the recipe for an autumn cheescake.